Anu Desai has been volunteering in District 204 for the past ten years. 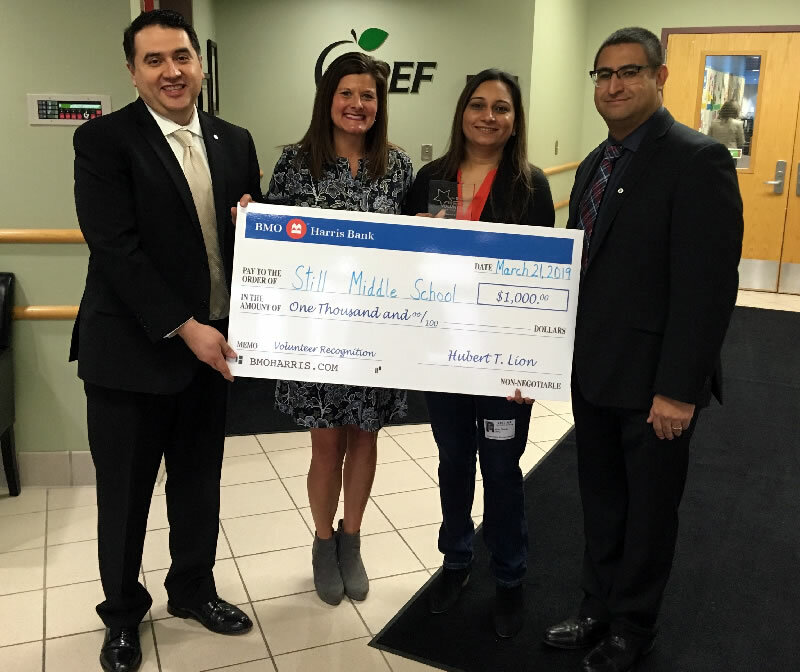 Because of her commitment to fundraising at Still Middle School, she is being named the BMO Harris Bank District 204 Volunteer of the Month. Anu has a son who is a freshman at Waubonsie Valley and a daughter in 7th grade at Still Middle School. Her school volunteerism began when her son started kindergarten. She has led multiple PTA committees such as Science Fair, STEM and PDAC. Anu also served as the PTA President at White Eagle Elementary School and Vice President and Fundraising Chair at Still Middle School. Principal Kimmer Cornish says Anu is an outstanding volunteer at Still Middle School and a valued member of their PTA. "Anu realized that the membership donations alone were not covering the financial needs of the building. Anu planned a 'Write a Check' fundraiser in which parents and students do not have to go out to sell anything and they can make a tax deductible donation to the PTA which will directly fund the Still Gives program, teacher grants and other student activities," Cornish said. Through the combined efforts of Anu and the committee members, they raised nearly $12,000 and were able to donate $4,000 to the Still Gives program, which supports families in need. Anu was very grateful to receive this honor. "I have tremendous respect for everyone who volunteers and I know they will agree that the work itself is very rewarding | to receive an award is the cherry on top," Anu said.